When getting bar stools, it is imperative you select the correct one to complement your home or business. On the off chance that you think you don't need a conventional wooden edge there are three extraordinary alternatives available to you: chrome, brushed steel, and glossy silk painted. Lakeland furniture is not only offering you the best of all three but also to help you pick the best choice for you. Trendy brushed steel bar stool and their smooth contemporary shine are going to look good both in household kitchen and at an industrial restaurant kitchen. Brushed steel stools are moderate yet elegant—they match perfectly with a wide range of stylistic design. Brushed steel barstool a particularly pleasant match for kitchens with stainless steel apparatuses. We offer you the assistance to discover how brushed steel barstools can add breathtaking style to your kitchen. Brushed steel stools have steel outlines with a metal silk wrap up. The end product is made by cleaning the surface of the metal, which makes a mark "brush scoured" look. Brushed steel is known for its example of barely recognisable differences and whorls that run parallel to the brushing bearing. These brushed steel stools come in a bigger number of metals than steel—other usually brushed metals incorporate aluminium and nickel. At Lakeland furniture, a large portion of our stools is made of steel. To start with, they're solid! Their welded metal edges face enormous measures of weight and strain. They're likewise simple to keep clean—they wipe off effectively, shroud fingerprints, and don't chip or scratch. Last, their strong metal furnishing keeps brushed steel barstools in fashion. Somewhat more costly, brushed steel bar stools are produced using top quality stainless steel. Despite the fact that it can be somewhat more inclined to scratching and fingerprints than chrome, these brushed steel barstools are astonishingly recolouring safe, strong to stamping and simple to clean. Brushed steel bar stools match impeccably with present day kitchens. Their styles incline toward the conceptual and retro, however, styles with both curves and edges are normal. Best of every one of, brushed steel bar stools are an incredible match for present day stainless steel apparatuses. Coolers, sinks, dishwashers are all extremely basic in brushed steel, and these stools fit ideal in adjacent to them. They likewise combine well with brushed steel equipment. In case you're hoping to include a touch of brushed steel bar stools to your kitchen, combine stools with new equipment and you're finished! Numerous kitchens have an industrial or restaurant look. Brushed steel stools are an astounding decision here, as well. They combine well with stainless steel islands and ledges, roof hung cookware racks, and mechanical cupboards and trucks. In case you're going for that Top Chef look, brushed steel bar stools work incredibly. All kind of brushed steel stools is comfortable in retro kitchens. The silver furnishing of these stools can add a twentieth-century punch to your retro theme. For a case of a stool that sparkles in retro kitchens, look at the Champagne swivel stool. In case you're not precisely beyond any doubt which brushed steel stool would be best in your kitchen, we're cheerful to offer assistance. Simply let us know the size and environment of your kitchen and we'll show you a few alternatives that would mix. In case you're attempting to coordinate a specific shading, we can prescribe stools with seat tones that will complement your overall theme of the kitchen. Lakeland furniture not only provides the best advice to pick the brushed steel bar stools for your kitchen but we also offer you all kinds of brushed steel bar stools. These stools will not give your kitchen a trendy and fresh look but these will also prove to be durable and stylish. You can clean brushed steel bar stools without any difficulty using any normal cleanser. No special treatment is required to clean the brushed steel stools and anybody can maintain these stools. 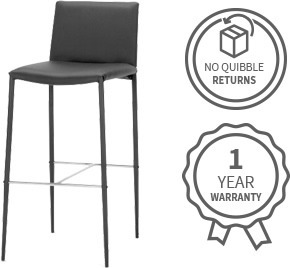 These stools will pay off the price as they will last longer than you are anticipating. As compared to other kinds of stools, brushed steel are superior choice among all the big restaurants in the world.